It used to be that only two speakers were needed to produce a satisfying music listening experience, and still can if you're only listening to music. However, despite renewed interest in vinyl records, dedicated CD listening, and a new breed of two-channel stereo receivers, today's emphasis on home theater surround sound requires new audio formats, receivers, and more speakers to produce the movie theater sound experience at home. One of the key changes in moving from stereo to home theater surround sound is the need for a dedicated center channel speaker. Stereo audio was originally designed to separate recorded sound into two channels (that is what the term "stereo" means), with left and right channel speakers placed in front of the room. Although some sounds come specifically from the left or right channel speakers, principle vocals or dialog are mixed into both speakers. With the vocals mixed to come out of both the left and right channels, a "sweet spot" is created that is equidistant between the left and right channel speakers. This gives the listener the illusion that the vocals are coming from a phantom center spot between left and right channel speakers. Although this is an effective way to present vocals, as you move the listening position from the sweet spot to either the left or right, even though the dedicated left and right sounds stay in their relative positions dictated by the left and right channel speaker, the position of the vocals will (or should) move with you. You can also hear this effect by using the stereo receiver or amplifier's balance control. As you dial the balance control to the left or right, you can hear the vocals change position accordingly. As a result, in a traditional stereo setup, since the vocals are coming from both the left and right channels, you can't control the position or level (volume) of the center channel vocals independently from the left and right channels. Surround sound provides an effective solution to the center channel problem posed by two-channel stereo listening. Unlike stereo, in a true surround sound setup, there is a minimum of 5.1 channels with speakers allocated as follows: front L/R, surround L/R, subwoofer (.1), and dedicated center. Surround sound formats, such as Dolby and DTS, feature sounds that are mixed into each of those channels, including sounds specifically directed to a center channel. This encoding is provided on DVDs, Blu-ray/Ultra HD Blu-ray Discs, and some streaming and broadcast content. As a result of how sounds are mixed for surround sound, instead of having the vocals/dialog placed in a phantom center spot, it is placed in a dedicated center channel. Due to this placement, the center channel requires its own speaker. Although the added center speaker results in a little more clutter, there are distinct advantages. Since the center channel is separated from the left and right front channels, its volume level can be changed without changing the volume levels of the left and right front channels. This comes in handy when compensating for dialog/vocals that are too low or too high in a music or movie soundtrack, as you can adjust the volume coming out of the center channel speaker independent from the rest of the speakers. Although surround sound has its own "sweet spot" it provides a more flexible listening experience. While sitting in the surround sound sweet spot is desirable, as you move your listening position from left to right, the vocals/dialog will still appear to come from its center position (although at an angle off-center from the sweet spot). This is more like it would sound in the real world if a person was talking or singing in that position while you move around the room. If you don't have (or don't want to to have) a center channel speaker in a surround sound setup, it's possible to "tell" your home theater receiver via its speaker setup options, that you don't have one. If you use that option, what happens is that the receiver "folds" what would be the center channel sound into the left and right front main speakers, just as it would in a stereo setup. As a result, the center channel doesn't have a dedicated center anchor spot and succumbs to the same limitations described for vocals/dialog in stereo setups. You wouldn't be able to adjust the center channel volume level independent of the left and right front channel channels. 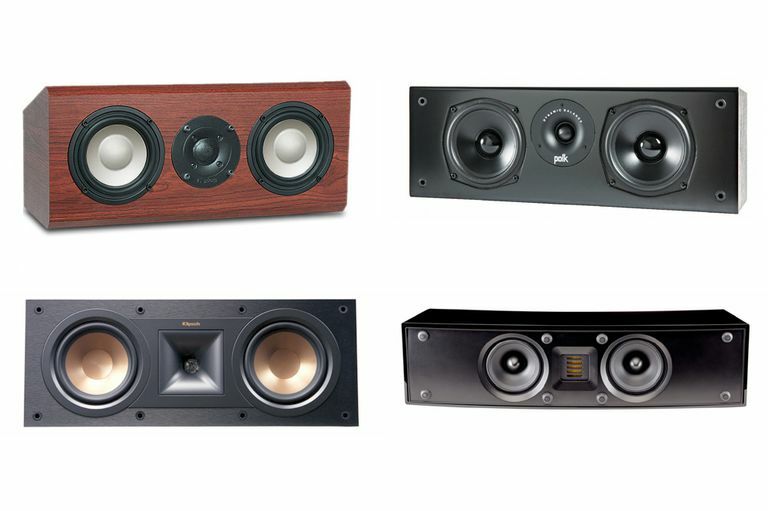 You can use any speaker (except a subwoofer) for your center channel, but ideally, you'd use a speaker that has a horizontal, rather than vertical, or square, cabinet design, such as the examples shown below from Aperion Audio and the others in the top photo of this article. The reason for this is not so much technical, but aesthetic. A horizontally-designed center channel speaker can be more easily placed above or below a TV or video projection screen. If you are adding a center channel speaker to an existing speaker setup, try to go with the same brand, and similar mid-range and high-end frequency response capability, as your main left and right speakers. The reason for this is that the entire left, center, right channel sound-field should sound the same to your ear. This is referred to as "timbre-matching". If you are unable to obtain a center channel speaker with similar characteristics of your left and right front channel speakers, if your home theater receiver has an automatic speaker setup system, it may be able to compensate using its equalization capabilities. Another option that you can try is if you are putting together a basic home theater setup from scratch, buy a speaker system that includes the entire speaker mix — front left/right, surround left/right, subwoofer, and the center channel. A center channel speaker provides a specific anchor location for dialog and vocals. The volume level of a center channel speaker can be adjusted independently of the other speakers in a system, providing more flexibility in balancing the total sound of the system. When shopping for a center channel speaker, consider one that has similar sonic characteristics to that of your left and right front main speakers. To facilitate optimal center channel placement, consider one that has a horizontal design so that it can be placed above or below a TV or projection screen and ideally positioned at an equal distance between the front left and right channel speakers. Check out our suggestions for Center Channel Speakers. What's Low Center Channel Dialog and How Do You Fix It?